"Attachments" tells the stories of 31 men, women, and children who found themselves at the gateways to America between 1880 and the end of World War II. 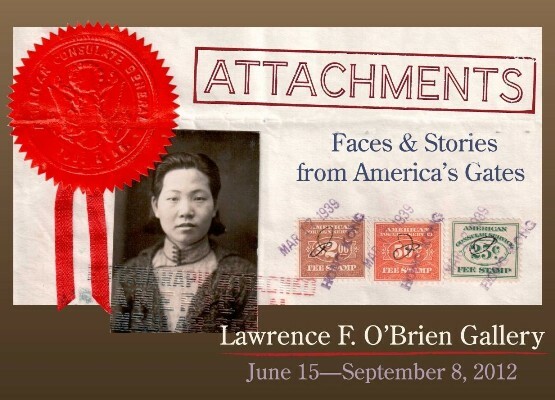 Their stories are told through original documents and photographs that were "attached" to government forms, and draw from a few of the millions of immigration case files at the National Archives. A young Polish child - whose parents are murdered by the Nazis - hides for two years in the Polish forests with an uncle and cousin. The boy survives the war but then spends six years in four refugee camps. Finally, in 1951, he is able to leave Germany and comes with his cousin to the U.S. He ends up in Cleveland, Ohio, where he is placed in a foster family, and becomes a U.S. citizen. There are still thousands and thousands of files in the National Archives. Many of them may be the story of your family. Lijkt mij een hele mooie tentoonstelling. Archieven zijn van papier, maar gaan over mensen.